It was late 2012. If Quest was a child it would have been at the peak of the awkward puberty stage; A middle schooler who just returned home from the dentist with a full set of braces. Quest was becoming something special, but it wasn’t fully formed. 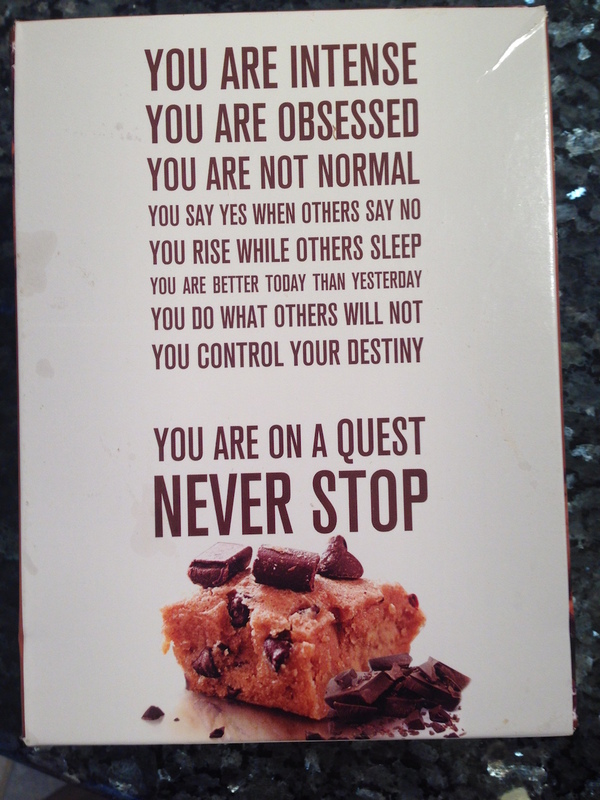 Case in point: the back of the box of Quest Bars. It all started with a late night email. I don’t remember what the email was about anymore, but someone said that Quest needed to be “less intense” and “a little more normal”. In a 10-minute fury of passion, I wrote the ‘You Are Intense’ manifesto, originally as a reply to the email. 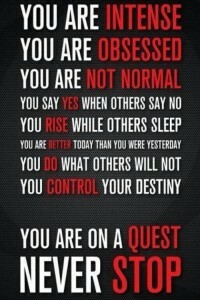 The Quest Manifesto was a hit internally. We had long bemoaned how hard it was to put the Quest spirit into words. It would always come out as trite. ‘You Are Intense’ seemed to actually do the trick. We turned the Manifesto into posters that were included with orders. We hung it around the office. 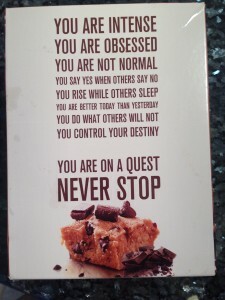 When we launched Chocolate Chip Cookie Dough Quest Bars, and needed copy for the back of the box, the obvious choice, of course, was ‘You are Intense’. All subsequent flavors got it too. There are now millions of boxes out in the world with those words printed on them. We receive emails from fans around the world describing how they’ve hung the back of our box on their wall. A kindergarten teacher sent a picture of it in her classroom. When I first interviewed Jessica-Rose, who would eventually become the head of our customer support, she told me the back of the box changed her life. 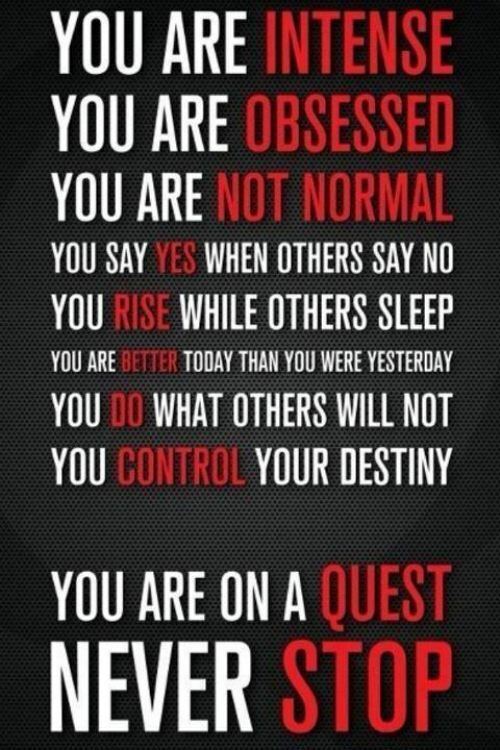 We put the soul of Quest into words. People responded, loudly. But was it the right external representation? It spoke to us as people, but was it Quest the brand? It was time to define our brand position. Brand position is communicated by the gestalt of what you release into the world. It’s the totality of copy, colors and images. You can’t declare your brand to be something. Your brand is something. All of the elements add up to a cohesive whole. Small day-to-day choices make up that whole. And as evident by ‘You are Intense’, those choices can spread across the entire brand quickly. Later in 2013, Quest President Tom Bilyeu, our community manager Clark, and I locked ourselves in a conference room. We weren’t going to leave until we had a campaign that accurately described who Quest was. We wanted to show people how amazing, fun and delicious a healthy lifestyle can be. We wanted to spark people’s creativity and get them to find joy in healthy food. Our brainstorm took less than an hour. We left the room with a clear position and a new mantra: #CheatClean. It was one of those lightbulb moments. The brand position had always been right under our nose. Now it was completely defined; Make healthy eating fun. At the 2013 Mr Olympia, our new position was brought to life. Mr. Olympia is one of the biggest sports nutrition trade shows with over 50,000 fans in attendance. Tom and I were looking at other booths and exclaimed how the Quest booth stood out. We were full of clean and delicious food. Every other booth had images of sweating six pack abs, veiny biceps, and necks draped in chains. We would later dub this ‘Chains and Veins’. It perfectly describes the standard brand position companies in sports nutrition employ. It’s easy to fall into the trap of doing what everyone else in an industry is doing. It’s safe. It’s obvious. It’s expected. But it tricks you into being one of many. ‘You are Intense’ is the written version of Veins and Chains. As was clear at the Mr. Olympia, there are plenty of fitness companies reminding people to be intense. But Quest’s job as a food company is to show fans that healthy eating can be fun. ‘You are Intense’ didn’t do that. Having copy that wasn’t perfect didn’t slow down our growth. Using it for the back of the box of Chocolate Chip Cookie Doug was better than delaying for something better. As Steve Jobs said, “Real artist ship”. Often times, something is better than nothing. ‘You are Intense’ worked in the moment, for the moment. It will forever live on as an important part of the Quest spirit. An internal rally cry. A revealing glimpse at what it takes to be part of this family. The words ring just as true today as they did in that first email. It just isn’t our brand position. The new design for the back of our boxes rolls out in a few months. 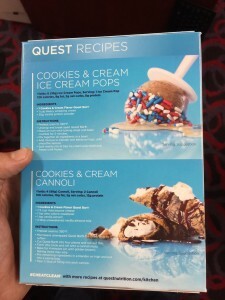 Anyone who follows the Quest brand won’t be surprised by what they see; Recipes with beautiful photography. With the introduction of the new back of the box, our braces will be removed to reveal a bright Quest smile. Our spirit may not be normal, but our brand is clean and delicious. We now fully reflect that.